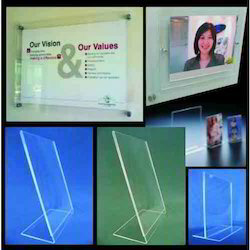 Our company is engaged in offering its clients a dependable and qualitative range of Acrylic Poster Holder. These acrylic poster holders can easily be mounted on walls, doors, cabinets, etc and they quite successfully cater to the need of branding and advertising. These products are available in standard sizes and also they can be availed in different customised sizes and shapes suiting the needs and preferences of clients. In addition, these holders can be placed horizontally as well as vertically. We manufacture technologically superior and splendidly engineered Acrylic Poster Holder and we also provide custom Acrylic Poster Holder. Outstanding features of our Acrylic Poster Holder are rich design for low maintenance Wide variety of models to suit all needs high durability and long life guarantee meeting all safety and quality standards. Looking for Acrylic Poster Holder ?